I don't currently subscribe to any monthly subscription boxes, but let me tell you this -- I am starting to really love the concept! 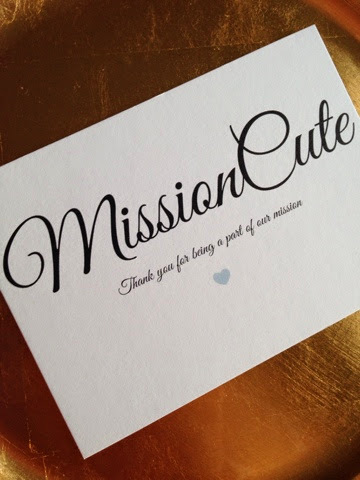 One of the reviews on the website compares Mission Cute to "Etsy in a Box" and I have to agree with that. 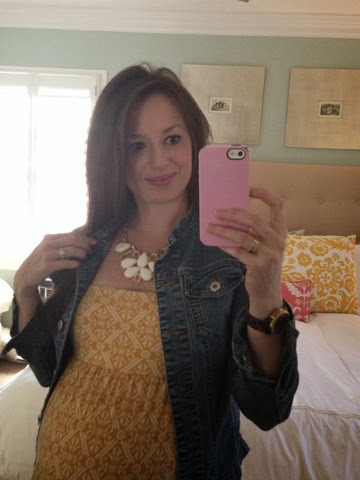 One of the items I received in my February box is this beautiful statement necklace, which I wear about once a week. The colors are ivory, gold, and a very light citrine color. It is a new favorite in my jewelry box. 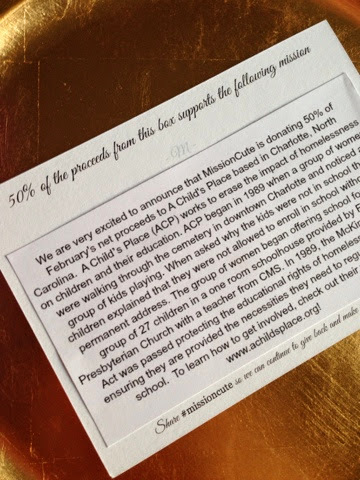 Each box comes with a card that describes that month's nonprofit. They partner with nonprofits all over the country, but this month was pretty special to me because the charity was right in my city of Charlotte, NC. The box and packaging itself are put together so well. You can tell that this company takes pride in putting together each and every one! 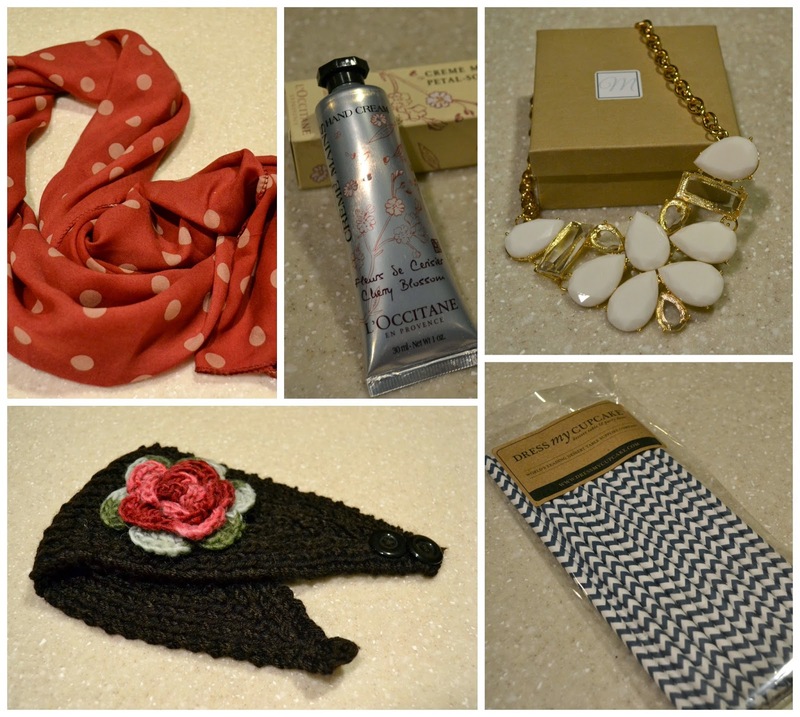 My February box included a chiffon polka-dotted scarf, some L'Occitane Cherry Blossom hand cream, my fun statement necklace, a crocheted ear warmer (I almost wouldn't mind another snow day now that I have this!) and some fancy paper straws. I really loved everything that was included in my box, but I also told myself that a box like this would be a really fun way to collect Christmas stocking stuffers for loved ones throughout the year. The only challenge would be not wanting to keep everything for yourself! The Mission Cute boxes start at $29/month, and shipping is always free. And if you want to meet the beauty and the brains behind this awesome concept, it's Samantha from The Ledford Life! A big thumbs up to this subscription box that definitely lives up to its name. I think the box things are a great idea. Except I am SOOOO picky and particular. Maybe I should get the dog one, I know Jax wouldn't care! Ha. awesome! I love the scarf & ear warmer! What a fun concept!!! Even if you get something YOU don't love, it would probably make a great gift for someone else!! I have never heard of Mission box but absolutely love the idea! Everything looks so cute! Oh man, this may had to my subscription box addiction...I currently do Birchbox and Stitch Fix! What a great concept. I love the pieces you got! I'm always wary of boxes, letting someone else pick things out for me isn't really my forte. I may have to take a chance on this one. Love that scarf!! Sounds like a great concept! I love this! I may have to try it. I had no idea my review was on the Mission Cute Site until you quoted it. "Etsy in a box" Love Mission Cute! How cute is this? I have not heard of this subscription box before but I'm heading over now to check it out and add it to my "must have" list! I'm going to look into this! What a fab company. I am so glad you shared about it! I am not one for monthly subscriptions either HOWEVER, I love that they give back 50% of their proceeds! What a great company to support! I will definitely have to look into them! I have subscribed to a beauty box before but I love the concept of this one! I think it would help me step out of the box with something I might not necessarily purchase but would end up loving! What a great concept! Love the necklace that you recieved! And that headband looks really cute as well! :) Thanks for sharing!